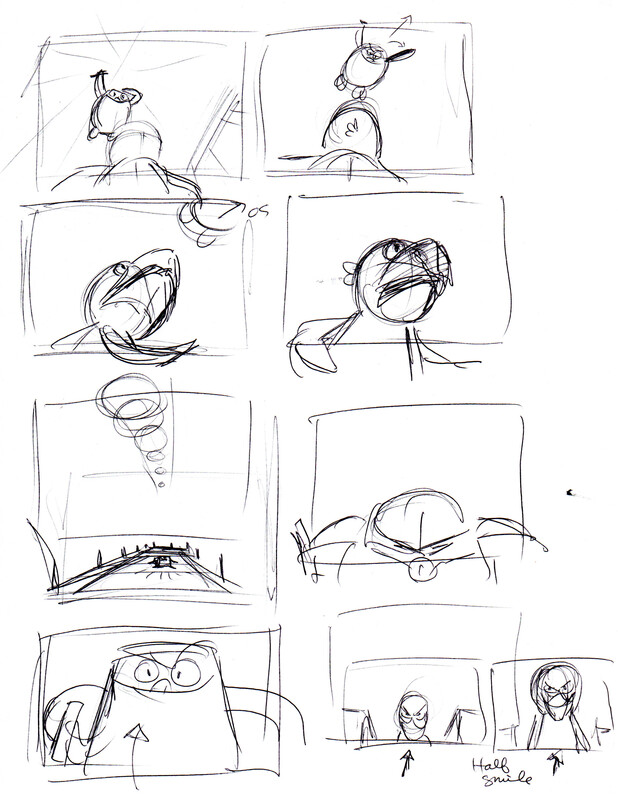 This is a good window into the world of how I approach a difficult sequence to storyboard. I get pen (so I’m not tempted to erase) and paper and just start plowing through it. I just start putting down shots, without much editing. If I don’t like a certain shot, I scribble it out and draw another panel and keep going. As you can tell, I also don’t worry too much about how pretty or “on-model” my drawings are. That will come at the clean-up stage. 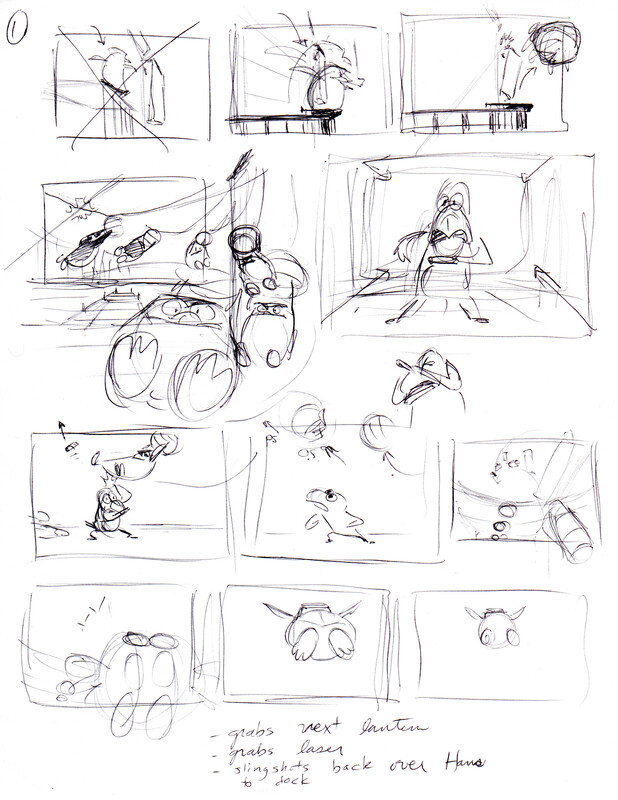 The thumbnail stage is just for getting down ideas as quickly as possible. To transfer paper thumbnails to digital form, you can always scan them into Photoshop. If I don’t have too many thumbs to digitize, I avoid the walk to the scanner and just slap my paper of thumbs onto my Cintiq and trace over them into a blank panel PS document (the Cintiq registers the movement of your stylus through the paper.) Voila! Instant rough on it’s own layer, ready for clean-up! Sometimes I will do thumbnails digitally. For that I have shrunk down a typical storyboard panel and copied a bunch of them until it filled up a single 8.5 X 11 Photoshop document (9 panels per page is pretty good; any more than that and the panels get pretty tiny.) Merge all the layers together (each time you copy and paste, PS creates another layer.) This way you have one layer of all your blank panels. Use guides to line them up neatly. Then lock that layer so the lines of the panels don’t intermingle with your artwork. Your artwork should go on its own layer. Now save this as your blank digital thumbnail PS template. Once you have scribbled out your thumbnails on your digital thumbnail template, you are ready to clean them up in regular-sized panels. First, make sure the artwork layer is selected. Next, with the rectangular marquee tool, select the panel you want to clean up, hold down the shift-key while dragging the selected artwork to a waiting regularly-sized blank panel PS document. 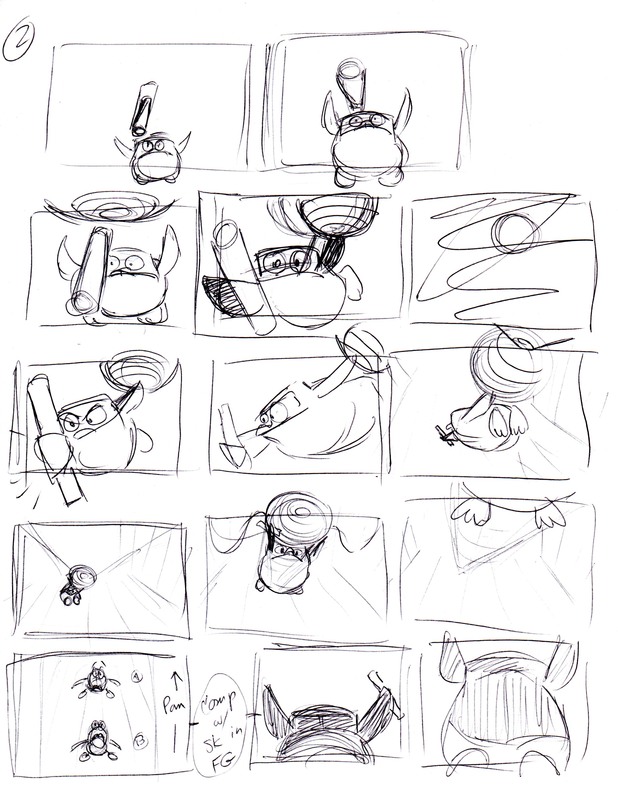 It will paste the rough onto its own layer, pretty much registered the way you drew it on the thumbnail sheet. I’m sure there is an action that could be created to automate most of this process, but I haven’t sat down to figure it out yet. Compare it to what aired on TV and let me know what you think! Oh man Dr. Blowhole is my favorite. Is this a new episode? Where can I find it? Yeah, this was our latest special, “The Return of the Revenge of Dr. Blowhole.” It premiered about a month ago. I’m not sure where you can find it now. (Nickelodeon website? Netflix? Hulu?) The whole last third of it is a musical! Definitely check it out if you can!